The ethical and therapeutic implications of receiving gifts from clients are explored. The importance of the issue is noted, and relevant ethical considerations are discussed. Therapeutic meanings that underlie client gift-giving are explored. By integrating the ethical and therapeutic considerations, four general categories of gifts are identified. Specific therapeutic responses to each category are identified and briefly discussed. It is not unusual for clients to bestow gifts upon their mental health counselors who, as a consequence, experience positive, negative, and mixed emotions (Spandler, Burman, Goldberg, Margison, & Amos, 2000). In such situations, mental health professionals must manage personal emotions and behavior adequately in order to respond therapeutically. However, little attention is given to such therapeutic events in graduate training. In addition, few guidelines on appropriate therapeutic responses to client gift-giving have been developed. Such client behavior can have important ethical and therapeutic implications (Beier & Young, 1998; Cappa, 2001 ; Dodds, 1985; Gartrell, 1992; Kritzberg, 1980; Spandler et al.). Yet, there is frequently professional ambivalence toward this topic that is, perhaps, reflected in the dearth of existent professional literature on gift-giving. As Spangler et al. note, although "there is a vast general literature on 'gifts,' this is not the case in psychotherapy where an intriguing silence predominates" (p. 80). The purpose of this article is to explore ethical and therapeutic issues that are relevant in client gift-giving situations. First, the extent and nature of client gift-giving are discussed. Second, relevant ethical and therapeutic issues are identified. 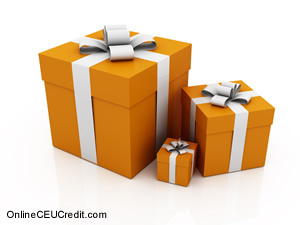 A scheme for categorizing and assessing gift-giving behavior is developed. Finally, several general suggestions are given for handling these incidents. Webster's Third New International Dictionary (Gove, 1993) defines a gift as "something that is voluntarily transferred by one person to another without compensation" (p. 953). The inherent value of the gift might be monetary, but can also be psychological and symbolic. The recipient knowingly recognizes its gift status and accepts it as such. There is no prior claim upon the gift by the recipient. In addition, the recipient is under no obligation to pay for it in the future. It is not unusual for mental health counselors to receive gifts from clients, although few studies have been conducted to investigate this phenomenon. In a review of the professional literature, only one empirical investigation on the gift-giving behavior of clients was found (Spandler et al., 2000). Another investigation examined the gifts received by physicians from their patients (Drew, Stoeckle, & Billings, 1983). Anecdotal evidence accrues from informal discussion with colleagues, who reveal numerous occasions of gift-giving. For example, one female client, who was typically scheduled at the dinner hour, frequently brought in food items such as strawberry pie or pizza to share with her mental health counselor. Another client, whose spouse worked for a snack distributor, would bring in bags of chips or pretzels that had reached their shelf life expiration date. Sometimes, the practice of gift-giving does not take place in such a straightforward manner. One client gave her mental health counselor a large photo album containing a number of family pictures. Another mental health practitioner, working for a nonprofit agency, reported that a client donated a large quilt for an agency fund-raiser and had attached to it a poster-sized note thanking the mental health professional for her excellent service. In each case, the gift item was dropped off at a time when the mental health professionals were in session with other clients. Drew et al. (1983) identified three general categories of gifts. First, gifts are often seen as a type of tip to the professional. The underlying motive of the gift-giver in this case may be likened to the restaurant diner. The client, who is pleased with the personalized service, degree of tolerance displayed, and timeliness of service seeks to compensate the mental health professional for providing service that is beyond the call of duty. Second, gifts are given to address a perceived imbalance in the professional relationship. For example, a store manager, upon an improved level of functioning, might give her counselor a gift certificate that is redeemable at her store. Such a gift may help the client regain status that was temporarily lost during her increased sense of dependency during a major portion of her counseling. Third, the gift might serve as a payment of homage or sacrifice to the mental health professional (Drew et al.). In such cases, the client sees the mental health counselor as using professional power on his or her behalf. For example, it might be through signing of appropriate forms by the mental health counselor that the client is entitled to specific benefits such as special housing, worker's compensation, or Supplemental Security Income. Gifts received in such circumstances can be viewed as the client giving thanks with a gift, similar to primitives paying homage to their god for a plentiful harvest. Sometimes, gifts offered by clients mark specific events or transitions (Spandler et al., 2000). For example, a client may give the mental health counselor a gift at their last scheduled session. Or a gift and card might be given in relation to a holiday or birthday. Gifts of these types might be related to culture and the gender. In one study, it was reported that the majority of such gifts offered to counselors were given by female clients (Spandler et al.). It is useful and appropriate to consider gift-giving as a form of communication. Spandler et al. (2000) speak of the meaning of gifts. For example, gifts come into being as a result of the will and intention of the gift-giver (Camenisch, 1981). And, in accepting the gift, mental health counselors implicitly acknowledge the giver's will, intention, and reasons for giving it. In addition, giving gifts is a common way of expressing and strengthening one's social attachments (Schudson, 1986). It is a socially acceptable way of communicating gratitude and eliciting positive emotions from the receiver. Gifts are used to buy love and soothe feelings of guilt. Gifts are a way of restoring a balance of power within a relationship (Camenisch). It is likely, though, that the client's meanings and intentions are implicit and may even be beyond the awareness of the gift-giver. Gifts can also be distinguished by the depth of meaning attached to them. Thus, it is useful to view the various types of gifts as lying along a continuum. At one end of the continuum, gifts received from clients can be considered as a form of ritualistic behavior. Wolin and Bennett (1984) distinguish between family celebrations and traditions. Although a party is a celebration, traditions include holidays, weddings, funerals, and other rites of passage. Frequently, the giving of gifts by clients accompany occasions in the counselor-client relationship that can be construed as traditions. For example, Shapiro and Ginzberg (2002) describe the use of "parting gifts" as a termination ritual in group therapy. Such gifts carry with them an intended meaning that is conveyed in an overt and intentional manner. The meaning and significance of the gift is readily perceived through an accurate perception of the situation and accompanying verbal behavior of the gift-giver. On the other end of the continuum, giving gifts serve as metaphors. In these instances of metaphorical communication, it does not suffice to literally interpret the gift or the interactive process surrounding the giving and receiving, because as Searle (1993) notes, the literal meaning calls into mind another possible meaning. Metaphors work by taking concepts that are not normally associated and juxtaposing them in a meaningful way that illuminates the similarity that exists in some way between them (MacCormac, 1985). In the example of the client who gave her counselor a family photo album at the termination of treatment, a deeper meaning might be related to unresolved issues of transference. - Gering, Mark; Receiving gifts from clients: ethical and therapeutic issues; Journal of Mental Health Counseling; Jul 2004; Vol. 26; Issue 3. The preceding section contained information about an introduction to clients giving gifts. Write three case study examples regarding how you might use the content of this section in your practice.